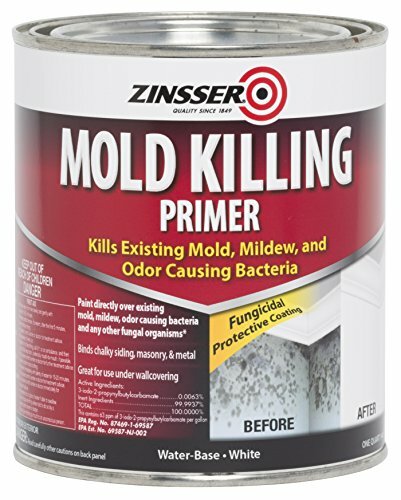 Zinsser mold killing primer is a water-based fungicidal protective coating that can be used to paint over existing mold, mildew, moss, fungi, odor causing bacteria and any other fungal organisms. The mold killing primer contains an epa registered antimicrobial to prevent the growth of mold, mildew and other fungal organisms on the paint film. Use indoors or out on a variety surfaces including under wall Coverings. Mold killing primer also aides in covering residual microbiological and fungal stains. A good bonding primer is essential to ensure that topcoats adhere to tough-to-paint surfaces. High adhesion primer increases painting possibilities by bonding to a wide range of surfaces. KILZ Adhesion is a unique latex primer developed to bond securely on slick surfaces where a traditional water or oil-base primer will not adhere. Bonds to tough-to-paint surfaces including Kynar, PVC, Formica, vinyl, glass, tile, glazed brick, chalky paints, glossy finishes, fiberglass and metals. Topcoat with either latex or oil-based paint. Use on most interior and exterior surfaces where a secure bond is critical. This problem solving primer can be used under epoxies, lacquers, and products containing Xylene or other solvents. This is a 1-gallon can of KILZ Adhesion High-Bonding Interior/Exterior water-based Primer in white. Covers approximately 300 square feet per gallon. Use on properly prepared surfaces free of dust, grease, chalk, mold, rust and peeling paint. Mix well before using. Apply with brush, roller, or spray. KILZ Adhesion dries to touch within 30 minutes and ready to recoat in an hour. KILZ has been making premium primers and paints for 40 years. KILZ was named Paint Brand of the Year in 2015 in the Harris Poll EquiTrend Rankings. A good bonding primer is essential to ensure that topcoats adhere to tough-to-paint surfaces. High adhesion primer increases painting possibilities by bonding to a wide range of surfaces. 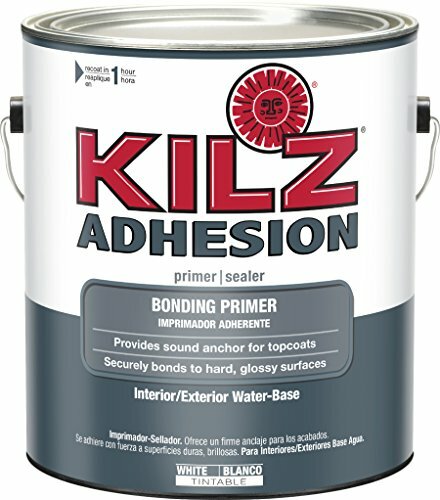 KILZ Adhesion is a unique latex primer developed to bond securely on slick surfaces where a traditional water or oil-base primer will not adhere. Bonds to tough-to-paint surfaces including Kynar, PVC, Formica, vinyl, glass, tile, glazed brick, chalky paints, glossy finishes, fiberglass and metals. Topcoat with either latex or oil-based paint. Use on most interior and exterior surfaces where a secure bond is critical. This problem solving primer can be used under epoxies, lacquers, and products containing Xylene or other solvents. This is a 1-gallon can of KILZ Adhesion High-Bonding Interior/Exterior water-based Primer in white. Covers approximately 300 square feet per gallon. Use on properly prepared surfaces free of dust, grease, chalk, mold, rust and peeling paint. Mix well before using. Apply with brush, roller, or spray. KILZ Adhesion dries to touch within 30 minutes and ready to recoat in an hour. 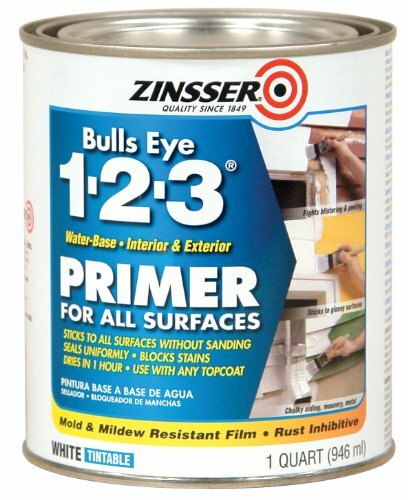 The Zinsser Bulls Eye 1-2-3 Water-Based White Interior/Exterior Primer and Sealer can be used on a variety of surfaces throughout the whole house. It adheres well to glossy surfaces, including tile and enameled trim. 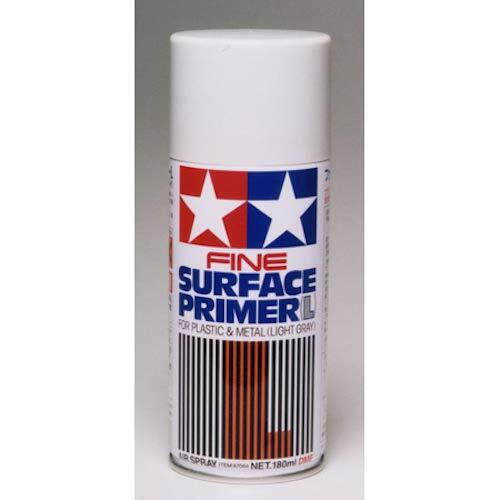 The primer inhibits rust on new metal and is ideal for application on alkaline surfaces. 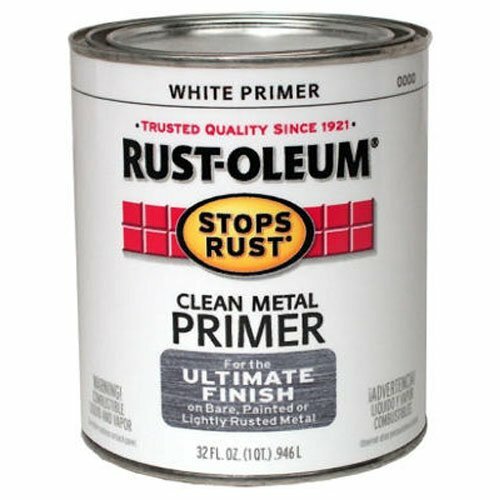 The finish seals tannin bleed and resists mold and mildew growth. Its breathable, flexible finish resists blistering and peeling. An ingenious combination of Primer and Colour Spray in one. The Colour Primers unique formula has been designed to be used on all metal, plastic and resin miniatures and leaves a perfect finish. The extra-fine pigment and special nozzle combination makes the Colour Primers easily cover the first time. The colours are matt, making your freshly sprayed miniatures or models ready for basecoat almost right away. Save both time and money. No need for 2 different sprays - all you need is 1 Colour Primer for perfect results. All primers are acrylic based, matt and dries very quickly. USE: 1. Shake for minimum 1 minute 2. Spray at a distance of maximum 20 cm. (no further) 3. spray in long burst whils moving the spray back and forth We advise you try out your Colour Primer on a old test model or similar first, to test the colour and finish before trying them out. VARNISHING - Apply Antishine Varnish in a thin coat. Never spray in humid conditions and cold weather. Test on a model first before spraying the whole army. A good bonding primer is essential to ensure that topcoats adhere to tough-to-paint surfaces. High adhesion primer increases painting possibilities by bonding to a wide range of surfaces. 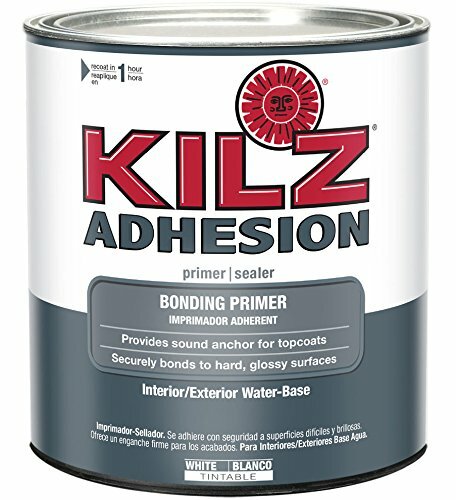 KILZ Adhesion is a unique latex primer developed to bond securely on slick surfaces where a traditional water or oil-base primer will not adhere. Bonds to tough-to-paint surfaces including Kynar, PVC, Formica, vinyl, glass, tile, glazed brick, chalky paints, glossy finishes, fiberglass and metals. Topcoat with either latex or oil-based paint. Use on most interior and exterior surfaces where a secure bond is critical. This problem solving primer can be used under epoxies, lacquers, and products containing Xylene or other solvents. This is a 1-quart can of KILZ Adhesion High-Bonding Interior/Exterior water-based Primer in white. Covers approximately 300 square feet per gallon. Use on properly prepared surfaces free of dust, grease, chalk, mold, rust and peeling paint. Mix well before using. Apply with brush, roller, or spray. KILZ Adhesion dries to touch within 30 minutes and ready to recoat in an hour. KILZ has been making premium primers and paints for 40 years. KILZ was named Paint Brand of the Year in 2015 in the Harris Poll EquiTrend Rankings. This is a 1-quart can of KILZ Adhesion High-Bonding Interior/Exterior water-based Primer in white. Covers approximately 300 square feet per gallon. KILZ MAX is a water-base primer, sealer, stain and odor blocker developed with new technology that's formulated to perform like oil-and shellac-based products. KILZ MAX tackles tough stains from water damage, rust, smoke, nicotine, grease, tannin, ink, pencil, felt marker, pet stains and more while also sealing pet and smoke odors. Use KILZ MAX on interior surfaces including drywall, woodwork, plaster, masonry, brick, painted metal, ceramic tile, glass and most other glossy surfaces. It forms an effective seal for porous surfaces for smooth paint application. KILZ MAX can be top coated with latex or oil-base paint. This is a 1-gallon can of KILZ MAX Latex Primer, Sealer, and Stainblocker for interior surfaces in white. Covers approximately 300-400 square feet per gallon. Use on properly prepared surfaces free of dust, grease, chalk, mold, rust and peeling paint. Mix well before using. Apply with brush, roller, or spray. KILZ MAX dries to touch within 30 minutes and dries to recoat in an hour. KILZ has been making premium primers and paints for 40 years. KILZ was named Paint Brand of the Year in 2015 in the Harris Poll EquiTrend Rankings. 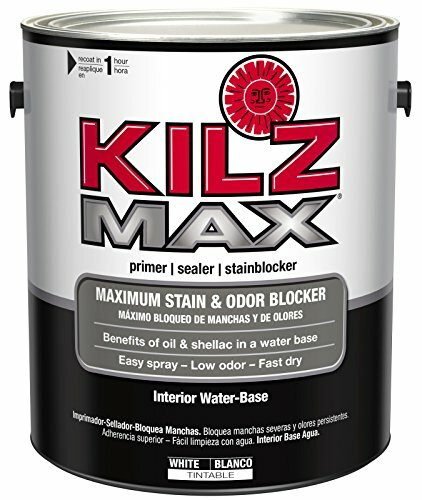 KILZ MAX is a water-base primer, sealer, stain and odor blocker developed with new technology that s formulated to perform like oil-and shellac-based products. KILZ MAX tackles tough stains from water damage, rust, smoke, nicotine, grease, tannin, ink, pencil, felt marker, pet stains and more while also sealing pet and smoke odors. Use KILZ MAX on interior surfaces including drywall, woodwork, plaster, masonry, brick, painted metal, ceramic tile, glass and most other glossy surfaces. It forms an effective seal for porous surfaces for smooth paint application. KILZ MAX can be top coated with latex or oil-base paint. This is a 1-gallon can of KILZ MAX Latex Primer, Sealer, and Stainblocker for interior surfaces in white. Covers approximately 300-400 square feet per gallon. KILZ MAX dries to touch within 30 minutes and dries to recoat in an hour. 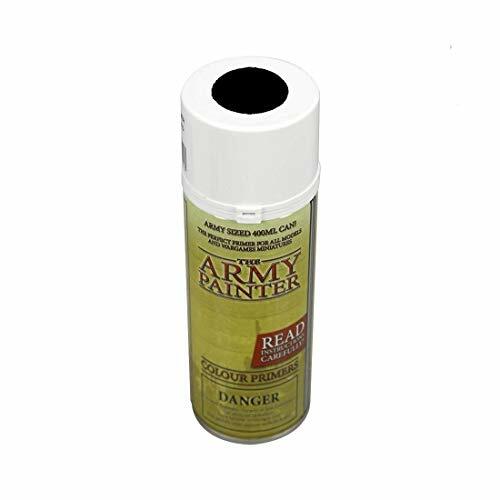 A good primer makes paint stick better to surfaces, makes paint color truer, and lets you use less paint. It covers existing stains and odors, and helps block new stains and odors. KILZ Original Low VOC oil-based primer blocks most stains including water, smoke, tannin, ink, pencil, felt marker and grease. It also blocks odors. VOC is 344 g/L compared with 443 g/L of KILZ Original. Use this versatile primer on interior surfaces including wood, drywall, plaster, paneling, wallpaper, masonry, brick, painted metal and properly prepared glossy surfaces. Not recommended on flooring. Use for walls or ceilings with medium to severe stains. For a water-base equivalent, look at KILZ Max. Dries to touch in 30 minutes. Recoat or top-coat after one hour. This is a 1-quart can of KILZ Original Low VOC Oil-Based Primer, Sealer, and Stainblocker for interior surfaces in white. Covers approximately 300-400 square feet per gallon. Use on properly prepared surfaces free of dust, grease, chalk, mold, rust and peeling paint. Mix well before using. Apply with brush, roller, or spray. KILZ Original dries to touch within 30 minutes and dries to recoat in an hour. KILZ has been making premium primers and paints for 40 years. KILZ was named Paint Brand of the Year in 2015 in the Harris Poll EquiTrend Rankings. A good primer makes paint stick better to surfaces, makes paint color truer, and lets you use less paint. It covers existing stains and odors, and helps block new stains and odors. KILZ Original Low VOC oil-based primer blocks most stains including water, smoke, tannin, ink, pencil, felt marker and grease. It also blocks odors. VOC is 344 g/L compared with 443 g/L of KILZ Original. Use this versatile primer on interior surfaces including wood, drywall, plaster, paneling, wallpaper, masonry, brick, painted metal and properly prepared glossy surfaces. Not recommended on flooring. Use for walls or ceilings with medium to severe stains. For a water-base equivalent, look at KILZ Max. Dries to touch in 30 minutes. Recoat or top-coat after one hour. 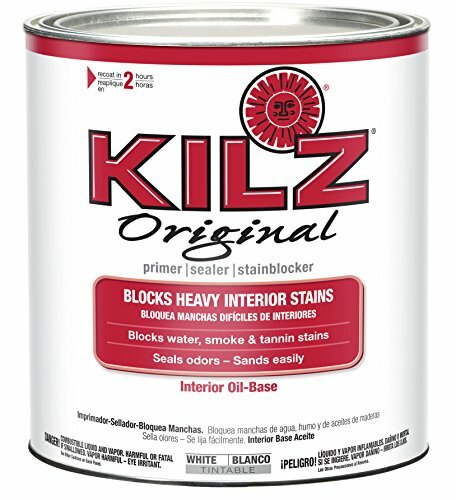 This is a 1-quart can of KILZ Original Low VOC Oil-Based Primer, Sealer, and Stainblocker for interior surfaces in white. Covers approximately 300-400 square feet per gallon. 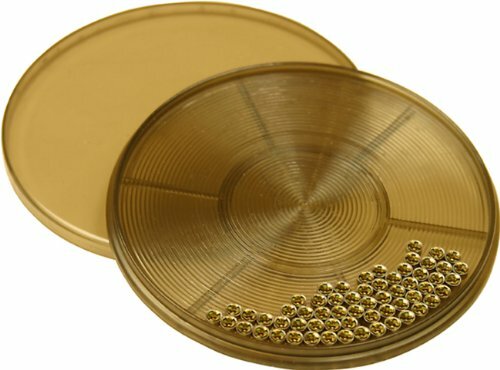 KILZ Original dries to touch within 30 minutes and dries to recoat in an hour. Specially designed for interior, residential surfaces in high-humidity, moisture and temperature environments including kitchens, bathrooms, powder rooms and laundry rooms. 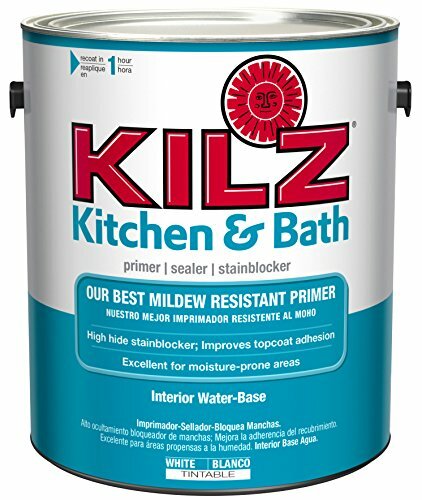 KILZ Kitchen & Bath Primer provides an enhanced mildew-resistant film that helps prevent mildew growth on the primer surface which may otherwise get "trapped" between the primer and paint coats. Kitchen & Bath Primer is white primer which helps provide a smooth and level finish. It offers high hide for color changes, blocks light to medium stains, promotes adhesion and seals porous surfaces. This low odor, very low VOC latex-primer dries quickly and can be recoated in 1 hour. Clean up is easy with soap and water. This is a 1-gallon can of KILZ Kitchen & Bath Primer. Features high mildewcide content that will help prevent mildew growth in kitchens, baths and other interior spaces prone to humidity and moisture. Specially designed for interior, residential surfaces in high-humidity, moisture and temperature environments including kitchens, bathrooms, powder rooms and laundry rooms. KILZ Kitchen & Bath Primer provides an enhanced mildew-resistant film that helps prevent mildew growth on the primer surface which may otherwise get trapped between the primer and paint coats. Kitchen & Bath Primer is white primer which helps provide a smooth and level finish. It offers high hide for color changes, blocks light to medium stains, promotes adhesion and seals porous surfaces. This is a low odor, very low VOC latex-primer that can be cleaned up with soap and water. This is a 1-gallon can of KILZ Kitchen & Bath Primer. Features high mildewcide content that will help prevent mildew growth kitchens, baths and other interior spaces prone to humidity and moisture. Use KILZ Kitchen & Bath on properly prepared interior residential surfaces including drywall, plaster, paneling, stucco, wood, brick, masonry, painted metal and more. KILZ Kitchen & Bath dries quickly and can be recoated after one hour. 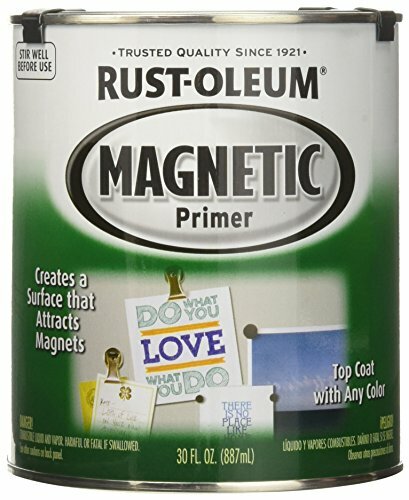 Rust-Oleum Magnetic latex primer is a dark gray colored base coat that allows you to create a surface that attracts magnets almost anywhere. Create a fun and unexpected way to hang notes, photos and more. Great to use on projects like organizing kitchen/cabinets, kid's playroom, hanging key holders near the door, office decorations, etc. Zinsser bulls-eye 1-2-3 spray White primer is an all purpose, high performance, oil-based primer for interior and exterior residential, commercial and industrial applications. Provides 20% greater coverage, and ensures longer life of top coats. 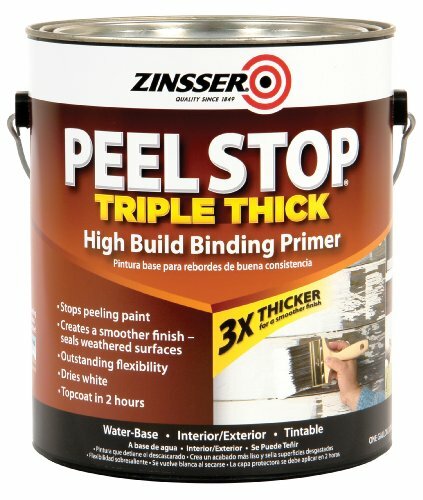 Coat right over peeling paint with Rust-Oleum Zinsser Peel Stop Triple-Thick Primer. 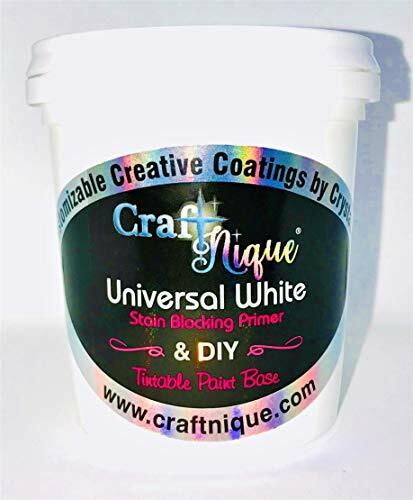 This high-performance, low-VOC, water-based binding primer locks down and hides peeling, weathered surfaces, creating a smooth, white finish for your top coat. 12 fl. oz. Giani IronCore Primer. Our primer is a bonding adhesive primer designed specifically to adhere to laminate - Formica - Corian - Cultured Marble - Wood and Ceramic Tile. Strong water-based modified acrylic urethane - 12 ounces will cover approximately 35 square feet or 16 running feet of standard 24" wide countertops - The Giani IronCore Primer is black in color and is the same Primer in all the Giani Granite Paint Kits - This Primer is easily applied with the roller included in each kit. The 12 oz. 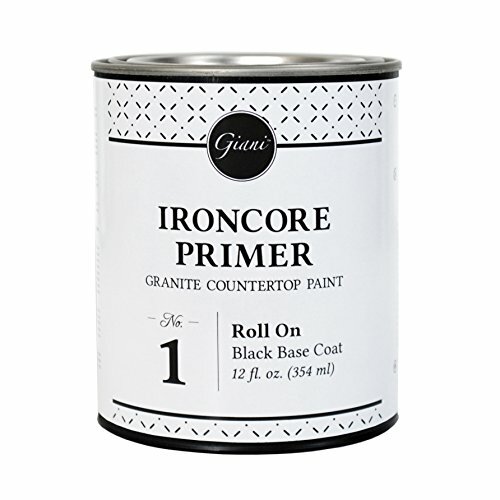 Giani IronCore Primer is the standard base coat included in all Giani Countertop Paint Kits. Superior coverage and durability. Protects against rust and corrosion on interior & exterior metal. Wide variety of beautiful colors covers the spectrum from pale to neutral to rich hues. Interior/exterior use. The product is QT WHT clean MTL primer. Easy and simple use kit. The product is manufactured in United States. For the ultimate finish on bare, painted, or lightly rusted metal. The MTM Primer Flipper is indispensable for saving the reloader time, especially when using an automatic feed priming device. Simply dump a box of primers into the flipper, replace the top, shake, and within seconds, all of your primers are anvil-side up. Could it be any easier? 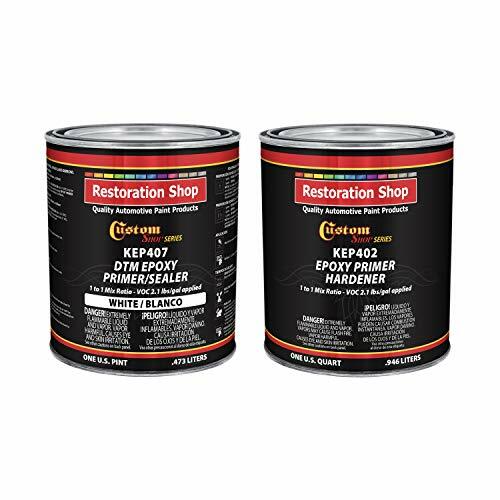 CUSTOM SHOP - KEP Series Anti-Corrosive Epoxy Primer / Sealer is a 1 to 1 Mix Ratio high performance primer specifically designed to be used DTM (Direct to Metal). KEP Series Primer contains an advanced resin technology system that offers superior adhesion to Bare Metal, Steel, Bare Aluminum, Fiberglass, Gelcoat. Body Fillers and most properly prepared Rigid Plastics and sanded OEM Finishes. 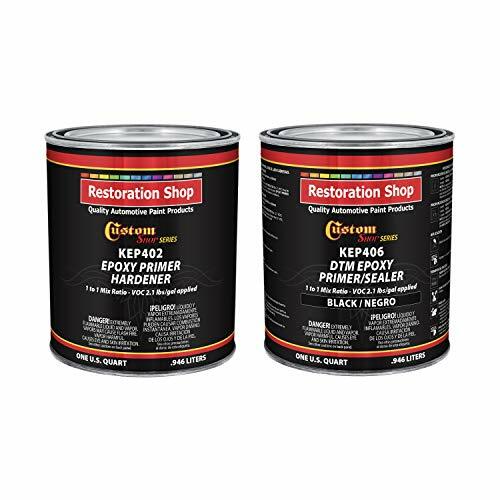 KEP Epoxy Primer is Lead and Chromate Free and its formulation contains a rich blend of Anti-Corrosive additives to achieve maximum defense against rust and corrosion. It also offers excellent salt spray resistance and is a fast dry product. CUSTOM SHOP - KEP Series Epoxy Primer is great as a DTM primer but also can be used as an excellent sealer for all single stage Urethane and Basecoat Clearcoat. If used as a sealer add 1/2 part of XR70 or UR70 reducer , topcoat or basecoat can be applied in 30 minutes. Using KEP allows for excellent topcoat gloss holdout. Available in Gray, Black and White in 1 quart kits, 2 quart kits, gallon kits and 2 gallon kits. Great for Automotive and Industrial applications. KEP is compatible with and can be top coated with most Automotive Paint brands like Custom Shop, Restoration Shop, PPG, House of Kolor, Valspar, etc. Lays down super smooth with an Easy ( 1 part to 1 part ) MIXING RATIO allows for more precise mixing, no induction time needed before application. Pot life is 4 hours once mixed. CUSTOM SHOP - KEP Series Anti-Corrosive Epoxy Primer is a 2.1 VOC lbs/gallon product that can be used coast to coast. Liquid Rubber A-Primer may be applied as a single component system using either manual or spray application methods. Manual application can be carried out using conventional brush or roller equipment, or alternately the product may be sprayed using a delivery system and nozzle appropriate for the viscosity of the material. 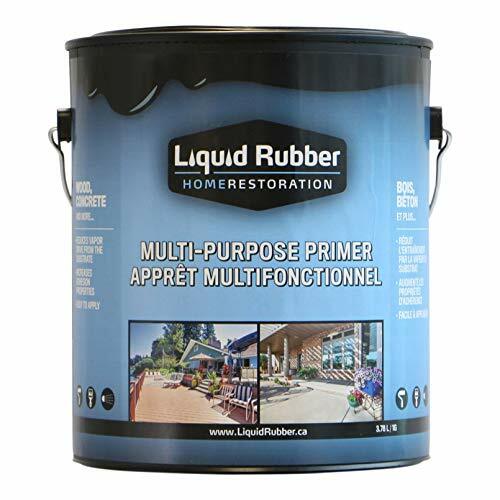 ENVIRONMENTALLY FRIENDLY - Liquid Rubber Multi-Purpose Primer is water based and non-toxic, containing no solvents and low VOC's. Safe for humans and pets alike! Anvil Gator Grip is a waterborne acrylic, non-slip, textured coating that provides a decorative light texture on concrete and masonry surfaces where increased traction is required. Gator Grip is formulated for use on interior and exterior painted or unpainted concrete surfaces such as residential garage floors, residential driveways, carports, patios, walkways, decks, stairs, ramps, basements, shop floors, pool decks, etc. 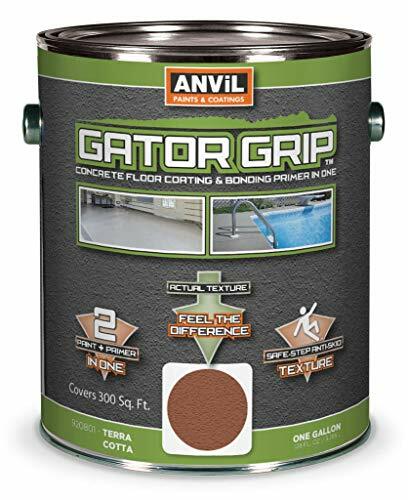 Anvil Gator Grip has a technologically advanced formula which combines the durability of an epoxy fortified coating and primer in a single component anti-skid coating. The texture finish is "bare-foot- friendly and is easy to keep clean. It is formulated to be highly resistant to automotive chemicals, oil, grease and gasoline. Gator Grip's durable acrylic/epoxy/primer anti-slip formula also resists fading, scuffing, cracking, peeling, and blistering. It is non-flammable, low odor and is environmentally safe. GatorGrip will help prevent weather deterioration of concrete while providing a unique light surface texture. Helps hide surface imperfections. APPLICATION: The surface must be clean and free of all wax, grease, oil, dirt, acid, mildew, release agents and all other surface contaminants. Failure to remove grease, oil, soap or other contamination will interfere with adhesion of the concrete stain. To clean a previously stained or painted surface, we recommend using Anvil 1450 Cleaner & Etcher (B00EHMMPC8). Remove loose or peeling paint. Rinse thoroughly with a power washer. Glossy painted surfaces must be dulled by sanding or abrading. Unpainted concrete surfaces should be mechanically abraded or acid etched before staining. 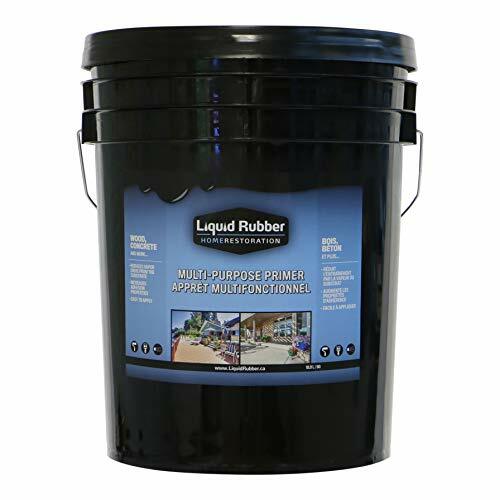 PRODUCT USE: Formulated for use on interior and exterior painted or unpainted concrete surfaces such as residential garage floors, residential driveways, carports, patios, basement floors, etc. COVERAGE: Coverage for Gator Grip is approximately 300 sq ft per gallon depending on surface and porosity. Easy clean up with soap and water. RECOMMENDED SURFACE PREPARATION: The surface must be clean and free of all wax, grease, oil, dirt, acid, mildew, release agents and all other surface contaminants. We recommend using Anvil 1450 Cleaner & Etcher (B00EHMMPC8). See product description below for further preparation details.